The book formerly known as EEL’S REVERENCE is about to be reissued, ever-so-slightly rewritten, as THE WOLVES OF PORT NOVO. Here is the scene in which the narrator, Aunt Libby (priests of Micah are entitled Aunt and Uncle), meets the toxic “reaver” (mercenary) priest, Aunt Isabella. Four more wardens, two male and two female, galloped into sight and pulled up sharp when they saw us. They struck their breastplates with their fists, at which Uncle Phineas lifted a benedictory hand. So wardens here not only went armed, not only abused the precious people they were supposed to serve as caretakers, they also pledged fealty – not to Micah, and to Micah’s people – but to a particular person. A reaver. They were joined by an Aunt and an Uncle in green-gold cassocks nearly as rich as Uncle Phineas’. Our guards struck their breastplates, and the new reavers blessed them. The Uncle seemed in high spirits, as if his ride had been great fun. He looked only about eighteen, four years into his priesthood, with thick, black, curly hair and eyes as green as his cassock. They even glittered, as if flecked with gold. The Aunt, fortyish, I would say, held herself with aplomb. I had the feeling she kept her soul on a very short leash. She had the smooth face of one who limits her expressions. Her chestnut hair, so fine and thin it looked like it had been painted on, had been twisted into a nut-like little knot at the nape of her neck. She was as slender as she could be without passing the line into “scrawny,” a line I had crossed more years ago than she’d been alive. Her hazel eyes were large and coldly bright – dispassionate eyes, without malice or pity. The Uncle and the wolves showed no interest in each other, usual behavior between reavers and wolves. The Aunt’s eyes narrowed when she looked at the sacramental beasts, her mouth turned down and her nostrils pinched, as if their very existence offended her. 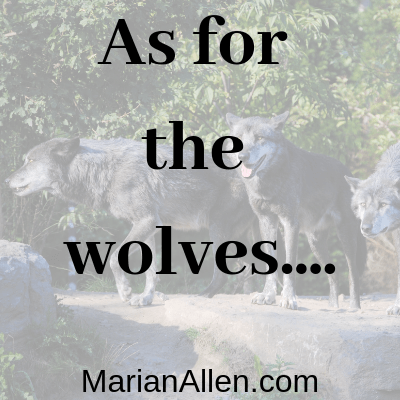 As for the wolves, all three of them turned their heads away from her, presenting their throats; not the sign of submission it seems, but an insolence. It meant they considered themselves so far her superiors they could open themselves to her attack without fear. Not knowing wolves, of course, the Aunt didn’t recognize the insult. She permitted herself a small, contemptuous smile. Isabella? Not the Isabella who had ordered Loach cut! I looked at Loach, who nodded at the Aunt and ran a finger along the scar he’d shown me before, now almost lost among his new wounds. A WRITING PROMPT FROM ME TO YOU: The target of an insult doesn’t get it, but someone else does. This entry was posted in EEL'S REVERENCE, Sample Sunday, WOLVES OF PORT NOVO. Tagged novel excerpt, science fantasy. Marian, this is tantalizing. Of course, I’m biased, because I love all of your words. Is this a second book in a series, first? Thanks for the kind words, Mitchell! This is a stand-alone book. I only have one series right now: the SAGE trilogy and the book of short stories that goes with it. Ah, okay, then! I can just keep an eye out for the announcement, then. Thanks for letting me know!